Thousands of medieval religious images in England were smashed up and broken during the turbulent years of the 16th century Reformation – when the country swept away the Catholic church and the monasteries and embraced the new Protestant faith. Another wave of destruction was unleashed in the 17th century under the rule of Oliver Cromwell. Many years later, English carvings and sculptures from the Middle Ages began to be discovered in Europe where, incredibly, they had survived. Some found their way to the British Museum and currently reside in glass cases – largely forgotten and sitting alongside Roman statues and ancient Buddhas. I visited the museum today and this stone carving took my eye. 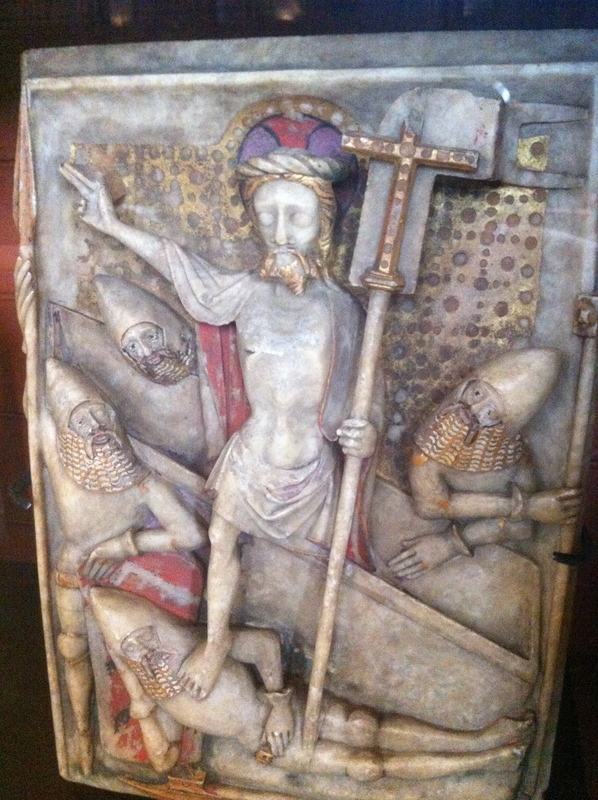 It was Easter Day and here’s a depiction of Christ emerging from the tomb surrounded by what are supposed to be sleeping Roman soldiers but are clearly knights of the 13th century. They didn’t care too much about historical authenticity in the Middle Ages! That is a fascinating wood carving. It is so exciting to see history unearthed like that. I wish that I was a history professor — Indiana Jones-style, of course.